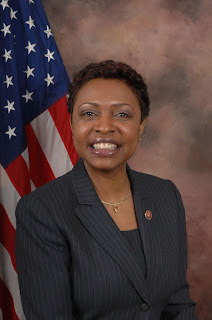 There is a petition on Change.org right now that you can sign in support of the Global Sexual and Reproductive Health Act of 2010, which was introduced in the House of Representatives on April 22 by Rep. Yvette Clarke (D-NY, pictured). This is an important piece of legislation that deals with the United States' role in international family planning and reproductive health matters. “Fulfilling the need for sexual and reproductive health services would produce dramatic results. For example, providing contraceptives to the 215 million women in developing countries who are not able to access modern contraceptive methods would avert: 53 million unintended pregnancies; 150,000 women from dying of pregnancy-related complications; 600,000 children from losing their mothers, and 25 million induced abortions each year. Simultaneously investing in family planning services and pregnancy-related care would achieve even greater results by slashing maternal deaths by 70% and newborn deaths by almost half. ” stated Rep. Clarke. According to Change.org, "The total cost of fully investing in family planning, maternal and newborn health would be $24.6 billion a year. While this is twice what is currently spent, it is less than $5 per person." And according to the legislation, "Poor sexual and reproductive health is the leading cause of death and disability among women of child-bearing age." Be sure to either sign the petition, which has a form letter you can send to your representatives, or write to your representatives yourself asking them to support and vote for the Global Sexual and Reproductive Health Act of 2010. You can read more about the legislation at RH Reality Check, or view the actual legislation here, or track it here. It is currently in committee. Five dollars a person. It's almost literally the least we could do. Right? Spare Candy is now on Facebook!